There are many reasons for experiencing neck pain and stiffness, but poor sitting postures at work are one of the most prevalent. On average, office workers spend 10 hours sitting each day, and this begins to take its toll on your back and neck. This happens because if you are not sitting in an optimal position, over the course of a few hours, days or weeks, pressures build up in the spine and surrounding muscles. There is a natural S-shaped curve in the spine. This can easily become exaggerated if you are in a seated position for prolonged hours throughout the day. The upper back and shoulders tend to round, leaving the chin poking forwards in order for the head to look up at the computer screen. This then can start to load too much through the joints at the bottom of your neck, and the muscles have to work over-time to support the weight of the head as it sits out in front. In addition, this poking chin posture can load a lot more through the structures in the back and top of the neck, in some cases causing headaches or a referral of pain into the back, shoulders and arms. Perching on the front of your chair can increase poor postures. 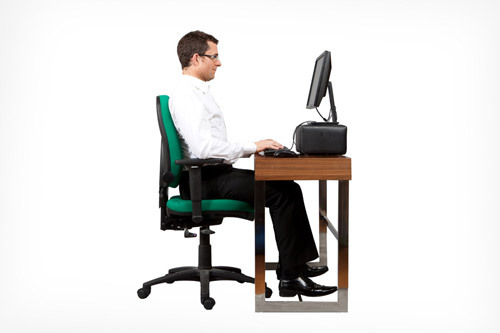 Try to sit with your bottom right to the back of the chair, sitting upright and use the back rest for support. Keep your shoulders back and avoid slumping forwards. Make sure your computer is at a good height. You want the middle of your screen to be at about eye level. Raise it up onto some books or a stand if necessary, so you are not looking up or down to see the screen. Make sure your chair isn’t too low. This can cause you to shrug up through your shoulders, leading to more overactivity of the muscles around the neck and increased tightness. Try not to hold a phone between your ear and shoulder – again, this can lead to increased tightness of the neck and shoulder muscles. If you need to use the phone and computer simultaneously, try getting a headset. If you have multiple screens or refer to documents, make sure they are in as best position as possible to minimise repetition of head movements. Consider getting a stand for your documents. Aim to get up and have a walk around the office every couple of hours if you don’t already. Stretch and twist through your back and neck to keep mobile. If you need further advice about work station set up, then please get in touch.